When we talk about endemisms in Ethiopia, the ornithologist’s mind goes often towards this nice swallow, so much small and elegant as much localized. It has been said that the endemisms of the birds, among the few living birds able to move in flight and to overcome every obstacle, are usually linked to ambient and geographic conditions so much extraordinary to limit their expansion or better, that for reasons still unknown to us, have not yet experienced this necessity during the course of time. The White-tailed swallow is rightly one of these species, having a very limited territory of diffusion, stable, constant and never crossed. 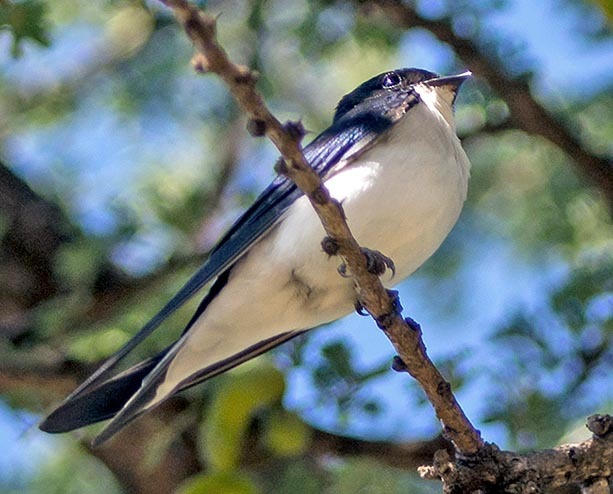 The White-tailed swallow (Hirundo megaensis Benson, 1942) belongs to the order of the Passeriformes and to the family of the Hirundinidae and is one of the 15 species endemic to Ethiopia. 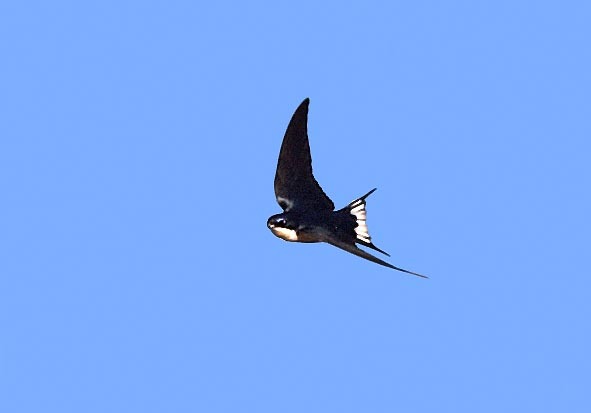 It is not easy to leave looking for this swallow so much localized with the certaint of meeting some specimens to observe, if the usually frequented sites are not known. Moreover, besides being concentrated in a very limited area, the diffusion is not so constant all over the occupied territory. Once the spot is found, it is then necessary to distinguish it among the crowd of swallows that frequent the sky of that area, seen that it loves to frequently fly together with other species, and during the winter overlapping with the migrants coming from Eurasia, this number becomes remarkable and such to confound even the most experienced eye. However, in the usual places it may be frequent and can be found in a good number. The etymology of the scientific name Hirundo comes from the Latin swallow and megaensis from Mega, the name of the small inhabited site of South Ethiopia near which the first specimen has been identified. The main vulgar names are: in French Hirondelle à queue; in English White-tailed swallow; in German Weißschwanzschwalbe and in Spanish Golondrina coliblanca. Locally, it is called “rarì” even if with this term they usually identify a swallow and at times any small flying being, regardless of the species. The white-tailed swallow lives only in South Ethiopia in a very small area in the Sidamo Province and specifically around the town of Yabelo and along the road for Kenya up to Mega at an average altitude of 1500 m. An extremely reduced area of about 2.500 square km that forcefully places it among the birds having the least occupied space. Its range partially corresponds to that covered by another particular endemism, the Stresemann’s bushcrow (Zavattariornis stresemanni), practically two very particular birds in the same area. The exact number of this bird’s population is unknown and this renders it even more mysterious and intriguing. Nowadays the birdwatching lovers share the information about the place where to find them giving details of the places with a GPS precision that gets to identify that group of huts or that thicket of acacias or that particular termite mound and only in this way they move without fail. Once on the spot, after some minutes of observation here is to appear, in a glimpse, the first specimen luckily followed by others but always inexorably mixed, depending on the different seasons, with the House martins (Delichon urbicum) and the Barn swallows (Hirundo rustica), with the colorful Red-rumped swallows (Cecropis daurica) and Mosque swallows (Cecropis senegalensis) or waves of Sand martins (Riparia riparia) and Rock martins (Ptyonoprogne fuligula). When flying, it is easily mistaken with the Ethiopian swallow (Hirundo aethiopica). 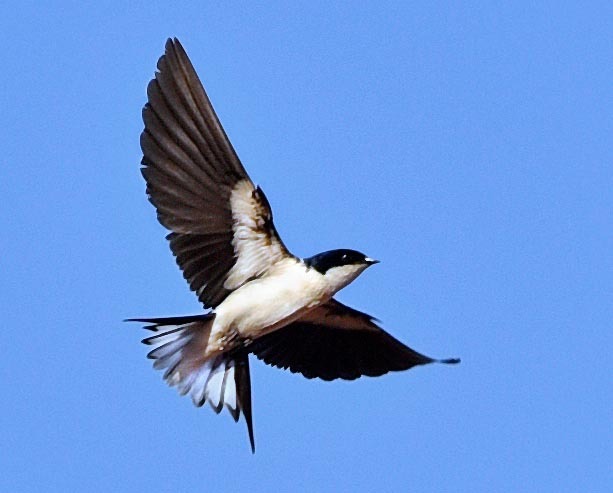 The flight of the white-tailed swallow is, moreover, quite nervous and restless though very light and elegant. It hardly can be seen flying with serenity as our swallows do, but it rather resembles more to those of the house martins, a continuous, rapid and light zigzagging without a defined direction. There are only two known cases of observation beyond this small area, this to understand that this swallow is kept under strict control in order to verify that there are no other hidden locations where has survived any peripheral colony and to confirm how little this bird derogates in its own borders. One first observation at Negele, slightly further east in the Borana land and another one at Moyale, few km farther south of its range, the last small city before the boundary with Kenya. Unique accidental cases that might have reasons of juvenile vagrancy or of partial movements due to the meteorological conditions. The additional experiences and the observations of ornithologists in the future, will by sure contribute in making better known this small swallow. The typical environment frequented by this swallow sees the presence of little dense thickets, a little developped thorny underwood, cultivated fields and dried up pastures and a presence of human beings and of domestic animals, the whole dotted by tall termite mounds in bright ochreous laterite. Environment rich of insects in particular during the rain season but definitely sustainable in all seasons seen the permanent presence of this bird. Often, during its daily wandering hunting insects its is seen almost touching people without any fear and then suddenly alighting on the low branches of an acacia dominating the entrance door of a hut. The White-tailed swallow does not fear the proximity of the human being and coexists peacefully with the local population in the same way as our European swallow does. It nourishes of small insects and butterflies hunted uniquely in flight and also part of the light material such as feathers and blades of dried grass necessary for the nest is collected in the sky but it necessarily goes also to the ground for picking up small tufts of grass or other material necessary for completing the work. White-tailed swallow is a small swallow hardly reaching the 13 cm of length, the 12 g of weight and a wingspan of about 30 cm. It has black colour with strong bluish reflections on the back and on the upper tail that highly contrasts with the completely snowy white lower part. The head is black above up to the line of the mouth creating a hood that leaves the throat totally white. Particular characteristic giving the vulgar name to his bird is the white tail with the two outer feathers black forming a light edging and that exceed of a couple of cm the other feathers forming the typical bifurcation common in many hirundinids, a not always visible feature. The underwing shows a neat contrast between the white coverts and the black remiges and also from below is naturally visible the white of the tail with the black edging. The female is slightly less dark in the upper part and shows a minor quantity of white on the tail. The immatures have tendentially a more suffused and amber colour. The white-tailed swallow nidifies by the beginning of the rain season that indicatively corresponds from March to May. In this period besides the blooming of the local vegetation there is a remarkable increase in the number of insects favoring the breeding of the progeny. It had not been easy to discover where this small swallow nidified and initially it was thought that it might place the nest only in the fissures and the holes forming inside the very high and numerous termite mounds present in the area. Now it is known that only occasionally it places it in these structures preferring, on the contrary, to build it over the beams of the tocul, the traditional local dwellings built with straw and mud. There are no detailed and exhaustive information about the nidification of this small swallow but from some observations it has been noted that it lays 3-4 white brown-spotted eggs and that the hatching lasts, like that of the common hirundids, about fifteen days. Like all the endemic species confined in a very reduced territory, the white-tailed swallow is considered as an endangered species.